As with CCP’s first game, EVE Online®, launch is only the beginning of the voyage with DUST 514. Gamers can look forward to an ever-progressing game, built on the experience CCP has gathered over the past decade, as new features and upgrades are rolled out for years to come. The way to victory is now open to any intergalactic mercenary with the guns and grit to accept the challenge. With the launch of DUST 514, the struggle for interstellar dominance in New Eden escalates as DUST mercenaries forge their path to glory. The power to topple empires will be in the hands of all who choose to seize it. The game’s massive battlegrounds, deadly weapons, and futuristic vehicles form the foundation of the deep first-person shooter action that awaits, while unrivaled customization options allow players to shape their strategic advantage, tactical edge, and combat style with cunning and skill. DUST 514 is also fully integrated with New Eden, the notorious setting of EVE Online, a massive game universe that recently surpassed a half-million subscribers worldwide. As DUST players wage war in this first-person shooter at unprecedented scale, the outcome of each ground battle impacts the persistent universe, shifting the tide of war for legions of participants. 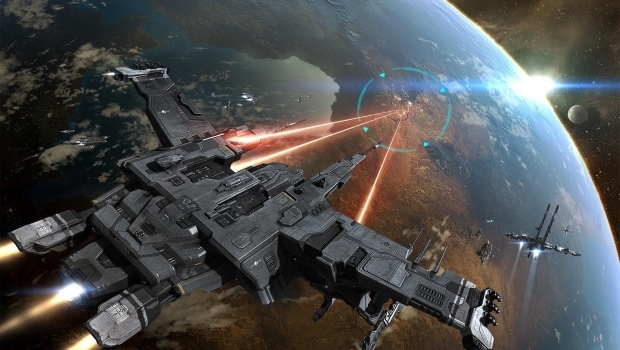 Mercenaries can gain the advantage by coordinating with starship pilots in EVE Online, calling in devastating orbital strikes against opposing squads. The fortunes of DUST 514 players will rise and fall as they align themselves with like-minded warriors to make their mark across the EVE Universe. Sony has hinted several times that they will be exploring the free-to-play market, and a title of this magnitude sends a clear message. The game looks pretty amazing, and the bits I’ve gotten to play were a lot of fun. You don’t have to take my word for it though – you can take it for a spin in just half a month. Look for our hands-on coverage as we get closer to launch. In the mean time, we’ve got a little over half a dozen new screenshots to share with you – enjoy!